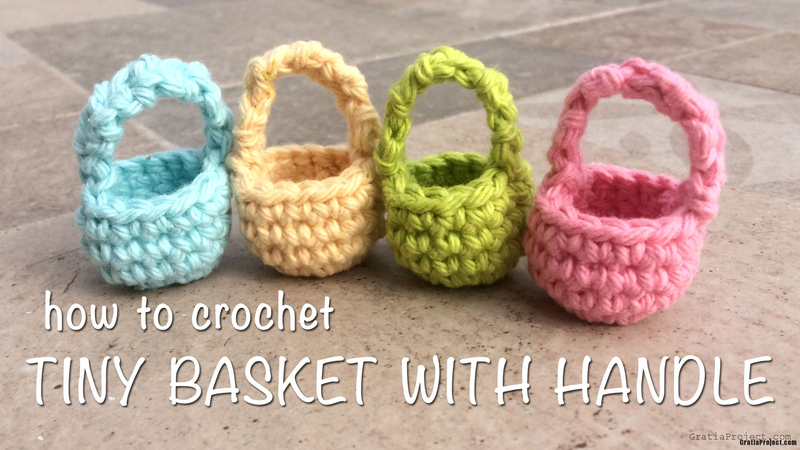 This is step-by-step video tutorial about how to crochet tiny basket with handle. Fill this cute baskets with candy, or little figurine-toys. In this tutorial, I used Lily Sugar ‘n Cream yarn (worsted weight) and size 4 mm crochet hook (7/0 Japanese size). Finished size of basket is about 1 x 1 x 2 inches. Round 2: Ch 1. 2 sc in each stitch. Total 16 sts. Round 3-5: Chain 1. Sc in each stitch. Total 16 sts. Do not fasten off. Continue making the handle. Ch 1. Sc in next st. Ch 1. (Turn. Sc in next st. Ch 1.) repeat until desired length. Fasten off. Cut the yarn. Sew handle to the other side.